Cover design using Fresco Sans by Fred Smeijers, based on the original cover design by Bart de Haas. Work by Amsterdam architects Langhot & Staal, J.L.M.Lauweriks and W.M.Dudok, and by H.Th.Wijdeveld, the founder editor and art director of Wendingen magazine. 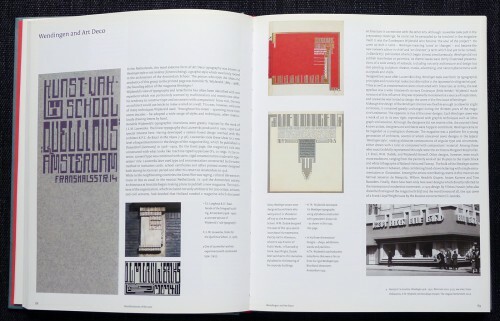 Architects-designers involved in De Stijl magazine: J.J.P. Oud and Vilmos Huszár. From the pre-1940 Amsterdam Typefoundry chapter. 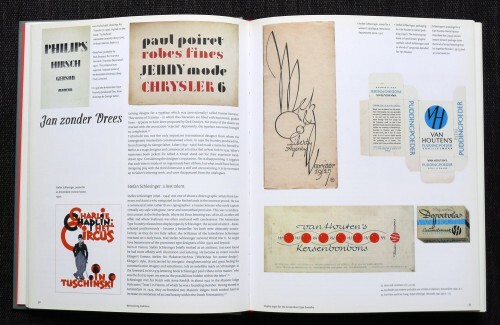 It includes original designs by Stefan Schlesinger, found in a container by my publisher Hans Oldewarris of 010, when the former Van Houten chocolate factory was emptied. Jurriaan Schrofer, who was part of the Total Design agency for some time . 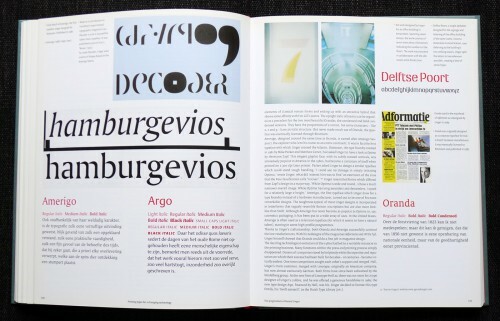 Published in March, 2004, Dutch Type was sold out about four years later. I think I can safely claim that it’s been widely praised, and is still liked. It is now frightfully expensive at antiquarian bookshops, online or brick-and-mortar, and I do feel kind of bad about that. But for various reasons – organisational, economic, and personal – no new edition was started up until early 2018. The reprint (self-published by Jan under his Druk Editions label) came out on October 1st, 2018. It was sent to c. 700 Kickstarter backers as is now available via distributors and bookshops**, practically world-wide. Having been fascinated by letterforms since an early age, I drew logos and headlines throughout my school and university years, but never studied design. Having become a journalist, I focused on performing arts and media. But while in San Francisco in 1987, I chanced upon Emigre’s Rudy Vanderlans, and wrote a short portrait of him for the leading Dutch daily I worked for – De Volkskrant. A year later, when in London to interview a choreographer, I saw Neville Brody’s big exhibition at the Victoria & Albert, and managed to talk to him – publishing the extensive interview in MAN, a lifestyle monthly I contributed to as a freelancer. 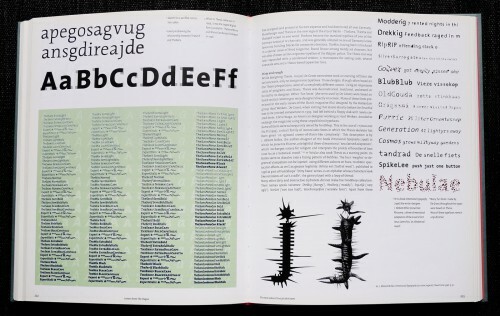 Fascinated by the trailblazing work of Brody and Emigre, I began an intense self-study of the history and theory of type design, and in the early 1990s began writing features about Dutch type designers – Gerard Unger, Martin Majoor, Luc(as) de Groot, LettError, Fred Smeijers – especially for the design trade magazine Items. I also published a lengthy report in Items about the very first typography conference I attended: FontShop’s FUSE 95 in Berlin. While there, I met lots of emerging type designers, design heroes, and renowned type writers. It dawned upon me that type – especially Dutch type – was an interesting niche where there was room for a voice like mine: a writer with a broad cultural interest, who had also become a user of digital type, as I had begun to design brochures, ads and websites for cultural organisations and pr agencies. When at my second major conference, ATypI 1996 in The Hague, I carefully sounded out the Dutch type design scene for the interest in collaborating with a newcomer like me in putting together a book on their work and their precursors. I began working on the book the next year, BIS Publishers (who also published Items magazine at the time) was interested, and my friend Rick Vermeulen of Hard Werken studio in Rotterdam did some early cover and page designs. As my research became more and more serious and the book less frivolous, I realised I would love working with a designer who was more of an insider. Rick understood. I approached Peter Verheul, who was very interested and who decided to team up with book designer Bart de Haas. I also thought that a publisher with a less populist and more academic list might be a better context, and switched to 010 Publishers. Bis’s Rudolf van Wezel understood, and we continued to collaborate on other projects. 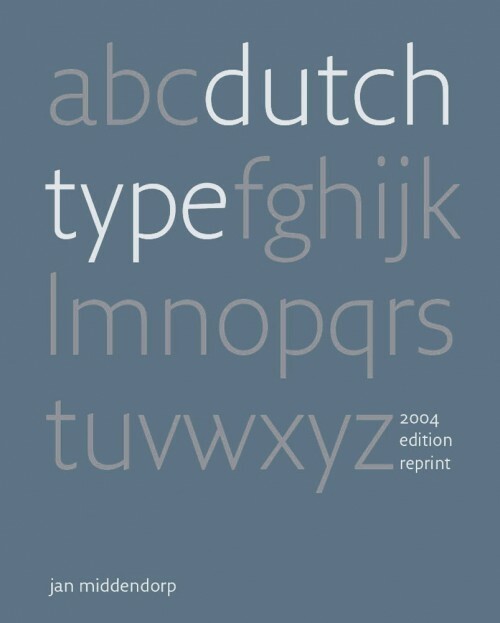 Dutch Type was announced for 1999, then 2000, etc. … and came out seven years after I started working on it. 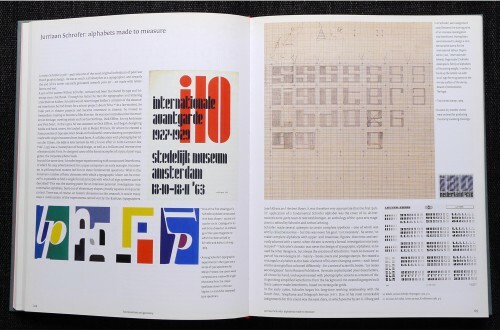 Designers, foundries, publishers, and cultural organisations were often very generous in providing information and visual material, and lending Bart and Peter fonts for small samples. 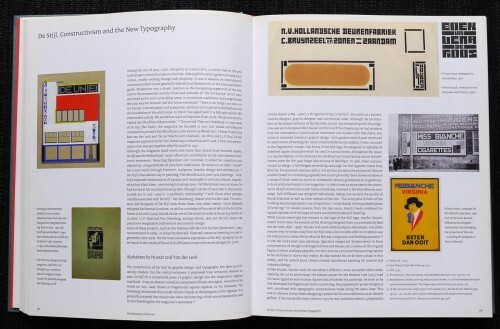 I bought, begged and borrowed dozens (or maybe hundreds) of publications, from type-related books and type specimens to historical examples of hand-lettered book covers, as well as posters. While I wrote the book, and did many of the scans and colour corrections of the material, Bart started working on the meticulous layout of the finished chapters and Peter focused on the expansion of the type family that would become Versa. For instance: as I often wrote long captions, being convinced that many designers would be too impatient to read the main text, we needed a space-saving captions font. And so Peter designed a Sans Condensed version of Versa. The first version of some early chapters was in Dutch. Then we realized that the text would be huge, and the translator into English would earn more than the book would ever earn me. So I switched to writing in English, but at the time my experience in doing so was limited. I was lucky enough to receive help and advice, most of it for free, from type designers and enthusiasts – among others from Matthew Carter, Mike Parker, Kent Lew and the young type blogger Andy Crewdson — who in the mid-2000s disappeared from the type scene. I’m still proud of the event I managed to put together for the presentation of the book in March 2004. My long-standing relationship with the management of the Haarlem Toneelschuur theatre – dating back to my work as a theatre and dance critic – helped me to hire the theatre for the event. This was doubly interesting: the building had been designed by illustrator and lettering artist Joost Swarte, who has several pages in the book; and it had recently been built in the Haarlem centre, at the exact site where the Enschedé typefoundry and printing house had been located. Wim Crouwel and René Knip gave short lectures. The event was also the occasion of the launch of the type designer band Wolfraam, consisting of Henk Lamers (digital loops), Just van Rossum (guitar), Peter Verheul (guitar), Donald Roos (saxophones) and Donald Beekman (bass). The band was partly the result of my plotting: Just, Peter and Donald R had all played on Henk’s self-published CDs; they liked the idea of playing live at the Dutch Type presentation; as they felt they needed more rhythm power to work as a band, I suggested they meet Donald B, who was not only a graphic and type designer, but also a professional hiphop bass player. The band continued to play occasionally for more than 10 years; Lamers’ loops were eventually replaced by the live beats of design critic and drummer Ed van Hinte. Wolfraam also resulted in a strong friendship between the Donalds, and Beekman joining Roos’ playful Vette Letters foundry. Design: Bart de Haas and Peter Verheul.